At most times of the day, Parkdale Avenue is a mess of traffic. This street has by default become the main corridor of traffic heading south between Preston and Island Park Drive. It features the Civic Hospital on one end, and Tunney's Pasture on the other. Through it's middle you have Wellington Street, the westerly end of Gladstone Avenue, and Sherwood Drive. 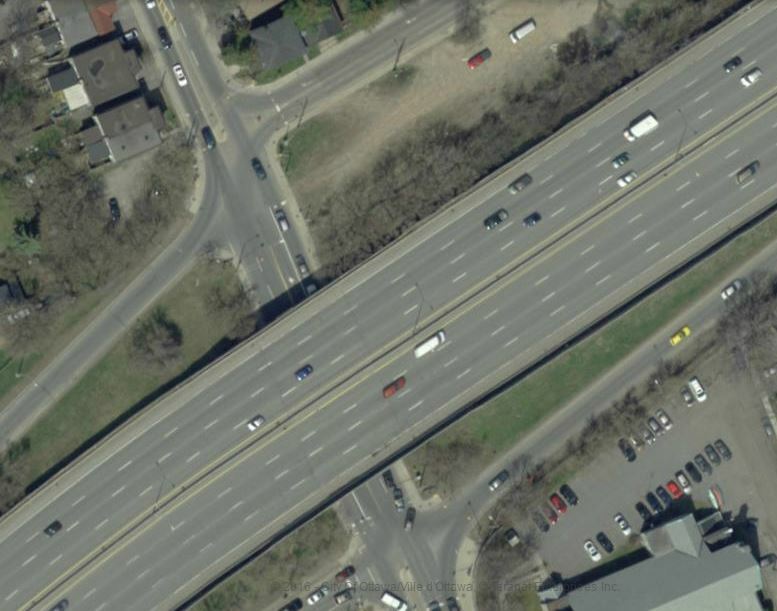 But perhaps most importantly, you have the Queensway off and on ramps going west and east. All told, Parkdale has become an increasingly difficult street to drive on, and is only getting worse as the area sees more condos and residential units added. Just wait until the Tunney's redevelopment kicks in. Some substantial proposals have been suggested over the past few years to fix the issue, including widening Parkdale Avenue somehow, or creating some kind of Gardiner Expressway-type overpass overtop of it's route. A few years ago the entire south side of Westmount Avenue along the westbound offramp was expropriated and demolished, to help improve traffic flow, and there are constant small adjustments being made to the street, with new signage, road markers and turning restrictions. I'm pretty sure major changes are still yet to come. All that aside, it's always neat to take a look back in time, when these traffic problems weren't so prevalent. Today I stumbled across this photo below from April of 1956, showing Parkdale Avenue looking north from the Queensway. Well, not exactly the Queensway... construction on the Queensway began in late 1957, though probably not around the Parkdale area until about two years after that. Prior to the Queensway, there existed a single line of rail track that ran the Queensway's route. This was the old Ottawa, Arnprior and Parry Sound Railway that was first laid in 1892, then later became the Grand Trunk Railroad, and finally the CN Railway line until 1952 (From what I understand, no trains ran on this track after 1952). 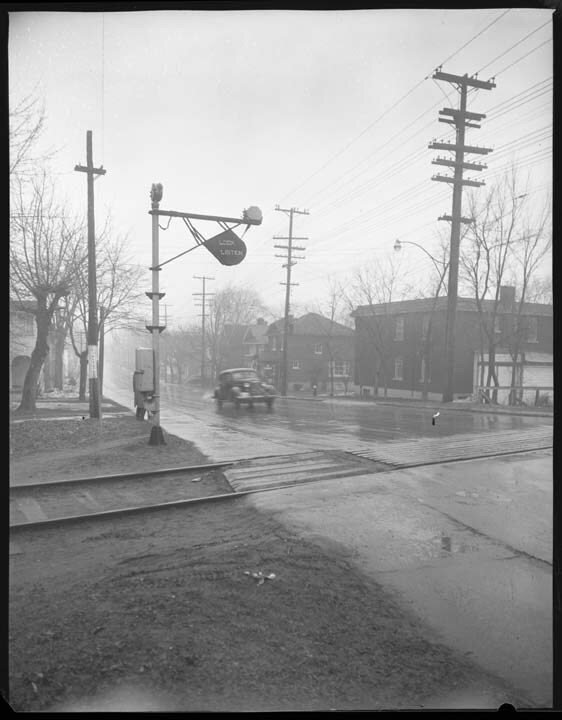 So in the photo below, you are looking at the level crossing at Parkdale Avenue. And below is the same intersection as it was in 2009. The house on the left is gone - though it oddly has a strikingly similar look to the house three doors down which now is the final house on the west side before the on-ramp, particularly with the curved entranceway. Indeed it is not the same house (see more photographic details below) but must have had the same builder and design, even though it was a single while the others to the north were doubles. 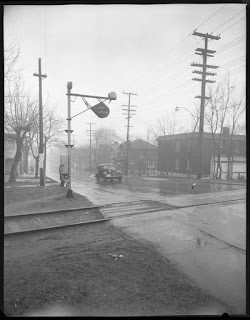 The house on the right in the background (north corner of Westmount) still stands today. 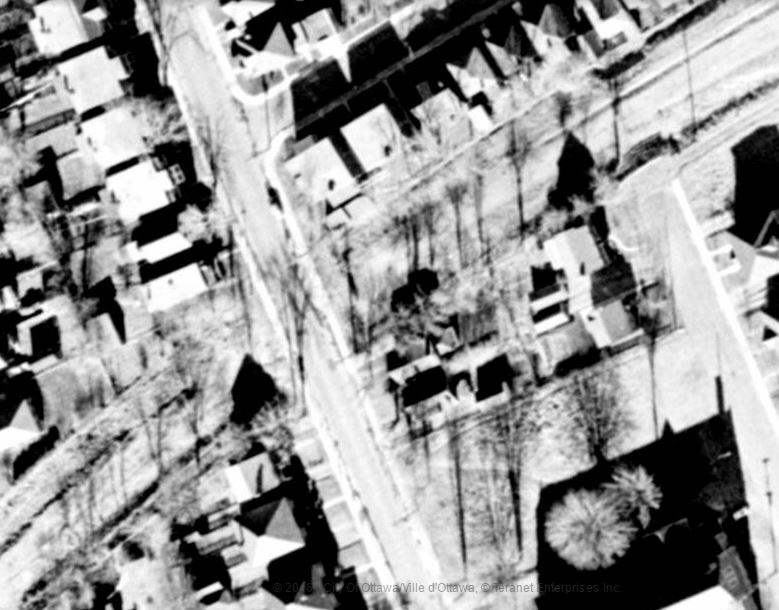 The closer house on the right is still standing in the photo from 2009 below, but was demolished a year later as part of the Westmount Ave expropriation. 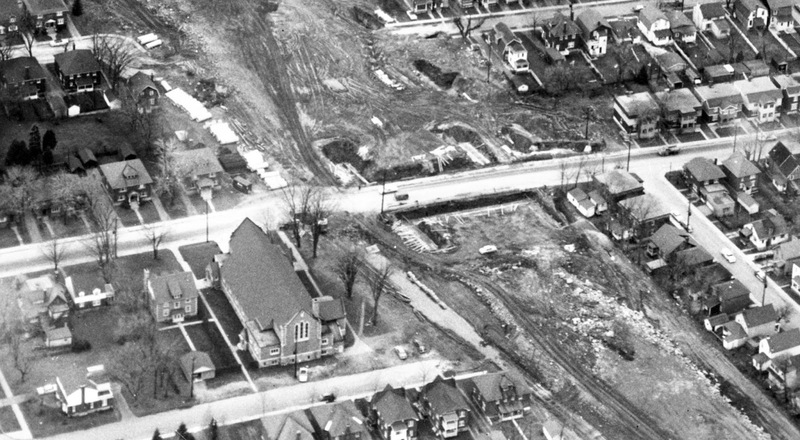 Even more impressive about this intersection, from an aerial shot from 1958 (borrowed from GeoOttawa) which shows the track running across Parkdale, are all the houses which existed before the Queensway, but were lost for its construction. Particularly interesting is that cluster of homes on the east side of Parkdale north of St. Matthias, which would now be the eastbound on-ramp. Parkdale runing top to bottom and CNR line left to right. at the bottom right corner. 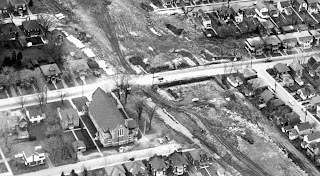 Finally, here's a view of the Queensway under construction in November of 1960 at Parkdale, with St. Matthias in the center, and Westmount just at the right edge. So much land cleared for it's construction. So there's a little Parkdale Avenue history for a late Monday evening. Sometimes I find a photo that's too interesting not to share, so I thought I'd build up a little supporting narrative around that great street-level photo from 1956 above, just to show how different things are 60 years later!